The increased computational power and software tools available to engineers have increased the use and dependence on modeling and computer simulation throughout the design process. These tools have given engineers the capability of designing highly complex systems and computer architectures that were previously unthinkable. Every complex design project, from integrated circuits, to aerospace vehicles, to industrial manufacturing processes requires these new methods. This book fulfills the essential need of system and control engineers at all levels in understanding modeling and simulation. This book, written as a true text/reference has become a standard sr./graduate level course in all EE departments worldwide and all professionals in this area are required to update their skills. 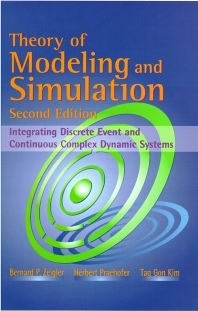 The book provides a rigorous mathematical foundation for modeling and computer simulation. It provides a comprehensive framework for modeling and simulation integrating the various simulation approaches. It covers model formulation, simulation model execution, and the model building process with its key activities model abstraction and model simplification, as well as the organization of model libraries. Emphasis of the book is in particular in integrating discrete event and continuous modeling approaches as well as a new approach for discrete event simulation of continuous processes. The book also discusses simulation execution on parallel and distributed machines and concepts for simulation model realization based on the High Level Architecture (HLA) standard of the Department of Defense. Senior undergraduate and graduate courses in departments of electrical engineering, systems science, and computer engineering. Professional engineers in the following areas, control, system engineering, system theory, modeling and simulation, and computer science. Part I: Basics. Introduction to Systems Modeling Concepts. Framework for Modeling and Simulation. Modeling Formalisms and Their Simulators. Introduction to Discrete Event System Specifications (DEVS). Hierarchy of System Specifications. Part II: Modeling Formalisms and Simulation Algorithms. Basic Formalisms: DEVS, DTSS, DESS. Basic Formalisms: Coupled Multicomponent Systems. Simulators for Basic Formalisms. Multiformalism Modeling and Simulation. DEVS-Based Extended Formalisms. Parallel and Distributed Discrete Event Simulation. Part III: System Morphisms: Abstraction, Representation, Approximation. Hierarchy of System Morphisms. Abstraction: Constructing Model Families. Verification, Validation, Approximate Morphisms: Living with Error. DEVS and DEVS-like Systems: Universality and Uniqueness. DEVS Representation of Systems. Part IV: System Design and Modeling and Simulation Environments. DEVS-Based Design Methodology. System Entity Structure/Model Base Framework. Collaboration and the Future. Herbert Praehofer is an Assistant Professor at the Johannes Kepler University in Linz, Austria. He has over 50 publications in international journals and conference proceedings on Modeling and Computer Simulation, Systems Theory, and Software Engineering. Tag Gon Kim is a Professor of Electrical Engineering at the Korea Advanced Institute of Science and Technology (KAIST), Taejon, Korea. His research interests include discrete event systems modeling/simulation, computer/communication systems analysis, and object-oriented simulation engineering. He is a senior member of IEEE and SCS, and a member of ACM.